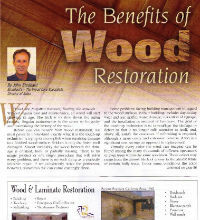 Wood the forgotten treasure, healing the wounds… Without regular care and maintenance, all wood will start showing its age. The trick is to slow down the ageing process. Regular maintenance is the secret to longevity and maintaining the beauty of the wood. Before you can benefit from wood restoration, we must pause to understand exactly what it is the touch-up technician is trying to accomplish when repairing damage to a finished wood surface. Seldom is only the finish itself damaged. Almost invariably the wood beneath the damage is crushed, torn, or partially missing. There is no magic product or any single procedure that will solve every problem, and there is no such thing as a perfectly invisible repair. If we consistently strive for perfection, however, sometimes we can come excitingly close.